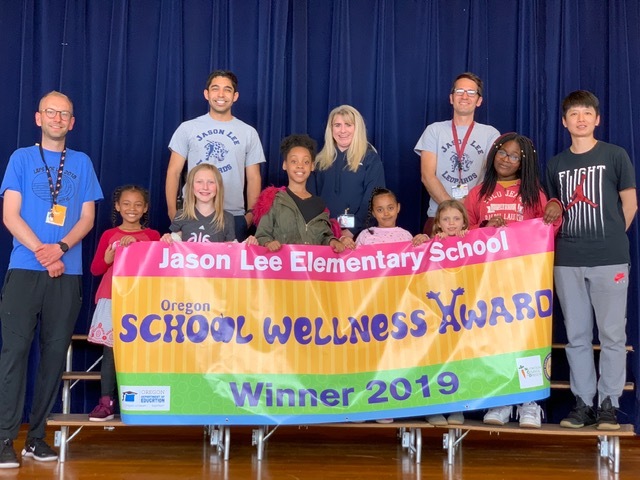 Jason Lee Elementary School in Portland has been recognized with a statewide award for literally “walking the walk” when it comes to championing wellness for students and faculty. Every Friday morning, rain or shine, Jason Lee Elementary School staff, students and parents walk or run the “Morning Mile” before school. Combined with the school’s physical education program, nutritious cooking classes for students and a community garden, you can start to see some of the many reasons why it was one of the two schools in Oregon to earn a 2019 School Wellness Award. The Nutrition Council of Oregon and the Oregon Dairy and Nutrition Council, the title sponsors for these awards, join the Oregon Department of Education in recognizing these schools. Each award recipient receives a $2,500 cash prize, a banner and a certificate of recognition presented at local school celebrations. Wilson Elementary School in Corvallis joins Jason Lee Elementary as the other 2019 award winner. The places where we live, work and learn have a big impact on our health. Wellness policies guide school efforts to establish an environment that creates a healthy workplace for staff, and promotes student health, well-being, and ability to learn. All districts are required to have wellness policies in place that meet Oregon’s minimum requirements, but schools can choose to implement stronger policies or additional programs to further support student and staff wellness. Each year for the past decade, Oregon School Wellness Awards have recognized outstanding schools for their efforts to improve child health by connecting nutrition, physical activity and academic achievement. On the tenth anniversary of the awards, the Oregon Department of Education announced three new schools as recipients for 2017. In partnership with Oregon Department of Education and Nutrition Council of Oregon, the Oregon Dairy and Nutrition Council serves as the title sponsor for these awards. Each award recipient receives a $2,500 cash prize, a banner, and a certificate of recognition presented at special school assemblies. “We are excited about how this award will help shape our future wellness efforts,” said Kylie Pybus, MPH, Health and Wellness Coordinator at Milwaukie High School. Schools are judged and selected based on criteria including school wide wellness policies and initiatives, physical education and physical activity, school meal programs and community involvement. Each one of this year’s winners were lauded for improving their standards and showing positive results in healthy student and staff behavior. “There is clear data that student health and student learning are connected,” said Joyce Dougherty, Child Nutrition Programs Director for the Oregon Department of Education. Oregon schools that are actively working to improve student and staff wellness are encouraged to apply for next year’s awards. To learn more, visit the wellness page on the Oregon Department of Education website. Toni Veeman served blueberry yogurt muffins as taste test for students at St. Paul Elementary. The principal at Milwaukie High School pedaled a smoothie bike to make tasty strawberry yogurt smoothies. St. Paul Elementary School was recognized for an updated wellness policy, great nutrition and physical activity. The school works with national wellness programs and enjoys strong support from the superintendent and local community.